So after deciding I was going to give sewing a break while I decided what I actually need in my wardrobe, I pretty much immediately had some energy and started on a new project. 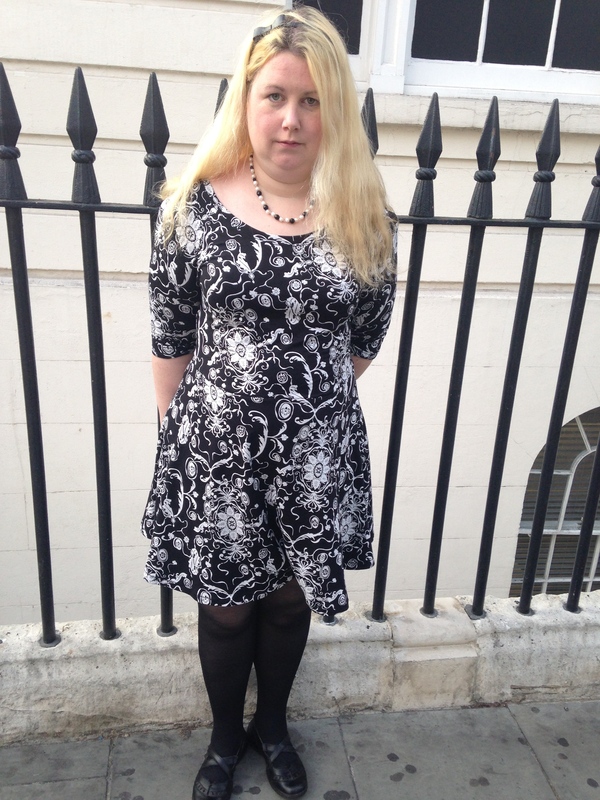 This is the Lady Skater Dress from Kitschycoo patterns. Pretty much everyone who is a serious sewing blogger made it ages ago, but I was putting it off because I do NOT like PDF patterns, at all! Not only do I find they don’t save you money, I mean even if I put the instructions in black and white I still had to print out 24 pages of full colour in order to see which line I needed to cut, but having to assemble and then cut out the patten pieces is really tiring and time consuming. Because I’m ill such a lot, when I sew I need things to be as easy and straight forwards as possible. PDF patterns are not good for this. However more and more independent pattern companies are putting really nice patterns out primarily as pdfs and there are remarkably few basic jersey patterns from the mainstream pattern companies, so I needed to have a go at it some time. Luckily, my boyfriend was working somewhere he could print the pattern off at work for me, and I had a morning when I was awake really early so I spent 2 hours preparing the pattern pieces feeling nice and awake for a change. Then it took me a week longer to get going than I thought it would as you need a special type of clear elastic for the seams of this, and I forgot I didn’t have any ball point jersey needles left so I had to order some. However these two things do not go together at all well, as the elastic completely ate jersey needles, I lost two in a very short space of time trying to sew the damn stuff down. In the end I gave up and just used the overlocker for any long seams involving the elastic. Apart from that, nice and easy pattern to sew, I think I was a straight size 7 which is the 2nd biggest size, and its come out looking remarkably well….. The fabric I used was one I had bought specially for doing mock-ups as even though it is a gorgeous pattern, and the white bit is printed into the fabric rather than sprayed on top, I still felt it is dubious quality. 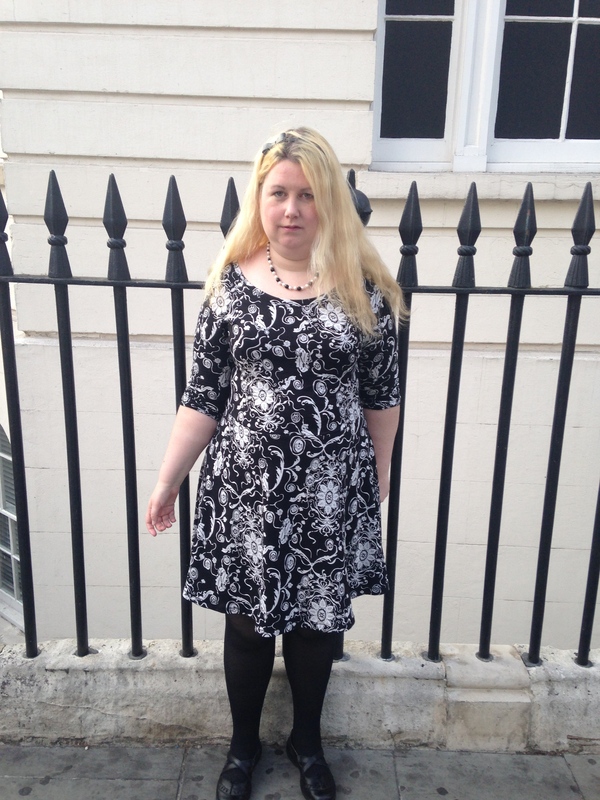 However it is one of those fabrics that looks infinitely better for being sewn into something and given a bit of an iron, so I think I’ve actually got a wearable dress out of it. 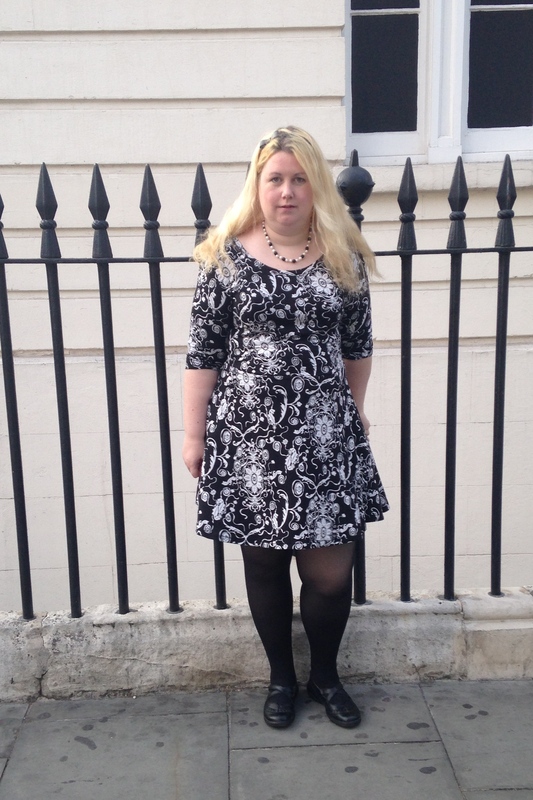 I’ve also got to say I love the length of this thing, I have an entire drawer full of skater dresses that I have bought over the years because they have really nice pattern, only to find they are so indecently short they can only be worn with cycling shorts underneath them for the gym or the very middle of summer. (or fat girl leggings, but I completely refuse to do the fat girl leggings thing!) It is so nice to find a pattern I feel comfortable with the length of. 🙂 I have ideas for another two versions of this I’d quite like to make. As far as immediate future sewing goes though, I’ve been doing a lot of pre washing this week and a tiny bit of dying, and hopefully I’ll be back working my way through the list I made at new year for the next few items. Which will be completely boring as they are well used patterns, but totally necessary as I have a few fairly urgent gaps in my wardrobe that I really need to fill. I really like the way this dress fits around the neck line. And overall it’s a great shape….land it looks lovely. I get the pdf thing…….ditto here. The instructions were so clear actually, it was a really clever way not to get that wavy fit you sometimes get on jersey clothes. Everything about this pattern is awesome, apart from it being a PDF basically, and slightly allergic to my sewing machine, but then my sewing machine is a basic model that is 15 years old, so that is completely it’s own fault!